The nicest sixty seconds of the day so far. “JUST BECAUSE I DON’T AGREE WITH YOU DOESN’T MEAN IT’S NOT TRUE.”That’s the memorable way Noah Baumbach responds to a journalist who offered up an interpretation darker than what’s on screen in his relentless, tragicomic study of emotional breakdown among the literary class in Margot at the Wedding. As thinking-out-loud that sounds as written as can be, not precisely a put-down, but a musing of precision, discomfiting, just shy of disdain, it captures the tone of his written dialogue as well. Margot’s in the midst of a breakdown, more terrifying than comic, running from a failed marriage, hiding her affair with an older man (Ciaran Hinds) who’s also her writing partner, and she leaps from irritation to cruelty in a blink. How do intelligent people deal with unintelligent behavior in their midst? Badly, for the most part, but Baumbach observes his characters with ruthless economy. Brief scenes are sketched from the perspective of the characters: there’s a beguiling subjectivity in how events are shaped, including those involving less-well-off neighbors who see a tree on the shared property line—a bold and blunt metaphor—as a purveyor of rot. The Zellers, old and young alike, are less judgmental than fearful of them, of anything that can be an Other. (There is a shockingly tender moment near the end between two members of that clan that underlines this.) This also suits the motifs of eavesdropping and inappropriate confidences: what is the subjective (mis-)perception at that moment? What's a writers' strike without a white-boi rapper anthem? 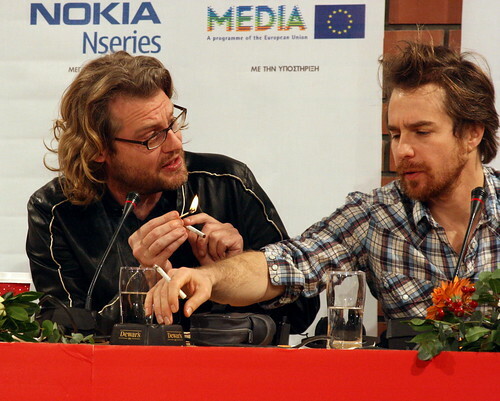 Of many photos I took at this year’s Thessaloniki International Film Festival between movies and other activites, this is among my favorites, of The Assassination of Jesse James by the Coward Robert Ford‘s writer-director and co-star Sam Rockwell, at a press conference for the film. What kind of director does Dominik look like here? The kind of director who would try to catch fire with The Assassination of Jesse James by the Coward Robert Ford. Diego Luna is one of three partners in Canana Films, along with producer Pablo Cruz, seen here. and Gael Garcia Bernal. Their intentions are to make movies that reflect contemporary Mexico, and in the first of two clips from a masterclass at the just-ended 48th Thessaloniki International Film Festival in the north of Greece, Luna describes the amusing differences between taking meetings in Los Angeles and being a director-producer in the country where he was born. With videos embedded in the linked page, the Webby Awards, for their twelfth iteration, cite their “12 MOST INFLUENTIAL ONLINE VIDEOS OF ALL TIME.” From the press release: “Although many of the videos on our list are no more than a few minutes long, their impact will be felt for years to come in everything from entertainment to advertising to politics,” said David-Michel Davies, executive director of The Webby Awards. “Each video sparked a trend or set a benchmark that changed the craft, business and culture of the moving image.” And they are? David Lynch gets a German blitzkrieg: I don't want to have anything to do with Hitler. There’s something fascinating about David Lynch at a podium marked “Urania” with a red curtain behind him, recorded in sloppy-cam, but there’s more to this public event than first sight, reports TIME. “David Lynch is no stranger to weird confluences,” they write, but he “failed to anticipate the reception his latest project got in Germany this week.” Lynch is touring Europe “to help establish a network of so-called “invincible universities” to teach the philosophy of transcendental meditation. The idea is to engender world peace. But at a meeting this week at a culture center in Berlin, Lynch triggered a less than peaceful exchange with German onlookers when Emanuel Schiffgens, his partner for establishing such a “university” in the German capital, suddenly veered into dangerous waters. “We want an invincible Germany!” intoned Schiffgens, the self-styled Raja of Germany… “What do you mean by this concept of invincibility,” asked an onlooker from the audience, made up mainly of film students with a smattering of meditation devotees. “An invincible Germany is a Germany that’s invincible,” replied a Delphic Schiffgens, who was dressed in a long white robe and gold crown. “Adolf Hitler wanted that too!,” shouted out one man. “Yes,” countered Schiffgens. “But unfortunately he didn’t succeed.” At that the crowd began shouting epithets at the speaker: “You are a charlatan! This is bad theater!” Lynch, who does not speak German, looked on in incomprehension.” More at the link, plus the entire conflagration, in two parts, from YouTube. Lynch’s reply in the comments of the video follows as well. David Lynch here. I don’t want to have anything to do with Hitler. We all know he was not a good person who did terrible things. I want to support Invincible Universities to develop the full potential of the student—enlightenment—and to have students meditating together in a group to enliven and radiate the unified field—the field of peace—into the atmosphere, into the collective consciousness of every nation. Invincibility in this case means dynamic peace—a situation where no harm can come from within the country and nothing destructive can come from the outside to harm the country. Sometimes misunderstandings are troublesome. So I want to make perfectly clear that the university for enlightenment and peace will make this a peaceful world — a peaceful world family — where anyone can travel anywhere in the world and meet a friend, not an enemy. Dynamic peace is not just the absence of war—it is the absence of negativity, which is the seeds of war. These universities, established on a permanent basis, will put an end to thousands of years of war and oppression, and prevent a man like Hitler from ever arising again. Do they whistle Dixie in Japan? Matt Damon observes.